We are excited to have Chef Charleen back as a featured chef for 2016! In 2014, she was featured in our garden pavilion, cooking up delicious gulay (vegetables) such as Adobong Kankong (watercress cooked in vinegar) and Ginataan Sitaw (long beans simmered in coconut milk). This year, she's working on her own dish, but while we wait you might want to visit her restaurant in Oakland. Or have them deliver! Nine months after signing the lease, Kainbigan Filipino Comfort Food, opened its doors in August of 2013. 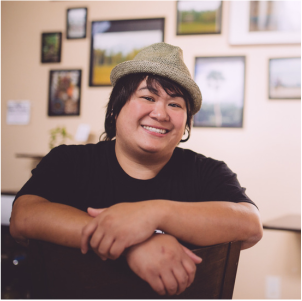 In the short year that she has been in business, Kainbigan has been cited twice in Zagat for her savory adobos and for adding to the Filipino landscape in the Bay. She has been featured on Adobo Nation and in Audrey Asian Lifestyle Magazine. She has been nominated for an Oakland Indie Award, catered to such celebrities as Goapele, the rapper Eve, famed poet Ursula Rucker and has recently been chosen as one of the featured chefs for the Lucky Rice Festival in San Francisco. She has been instrumental in introducing Filipino cuisine to companies such as Google, Zoosk, OkCupid and Eventbrite to name a few.